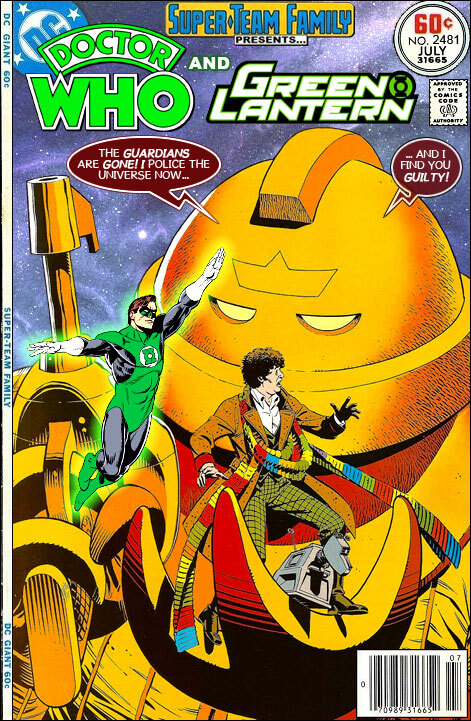 The artwork of Dave Gibbons exploded in popularity when Watchmen hit the stands, but the first time he made an impression with me was his work on Green Lantern. His depictions of Hal Jordan, John Stewart and the extended cast of the title looked great to me, his clean lines gave everything a modern feel. I was a big fan of his back up tales as well, featuring alien GL's in solo adventures. *His armor made him look like one of the Cybermen...who are allergic to gold! Tom Baker is MY Dr. Who. He rules all. "The Sontaran Special Security Service. Our business is minding yours." "The S.S.S.S? I say, isn't that carrying alliteration a little too far?" Maybe, next time, you could team GL and Spidey against one of those bounty-hunting rhinos after they mistake a certain Russian mobster-who-used-to-pose-as-Irish-American for one of their own. You mean the erstwhile "Alex O'Hirn?" What if I am a robot like the demon with the glass hand in *THE OUTER LIMITS*? And Is there nothing wrong with your television set? This message brought to you by "OBIT" chewing gum. How about, for a sequel, Dr. Fate and Doctor Who vs. Mr. Who? @Anonymous: it would be-"who've" you to send that inquiry to Ross, directly. The Green: Lama (Dynamite Entertainment), Hornet (Too many to list but I remember NOW Comics) , Lantern (Silver Age DC): In A Priest a Gangster, and a Cop walk into a bar. Written By Carl Reiner & Mel Brooks. Special guest stars Imogene Coca & Sid Caesar! I'm Don Wilson Your Announcer. "Oh Don!" - Your Cheap Friend Jack Benny. "That's the most ridiculous thing I ever hoid!" "Is dat youse Doiby?" - Woozy Winks. "Dat's Mr. Dickles, to youse!"